US Defence Secretary James Mattis calls on the Prime Minister Narendra Modi, in New Delhi on Sept. 26, 2017. New Delhi: India and the US on Tuesday reaffirmed their commitment to combat the global scourge of terrorism when visiting US Defense Secretary James Mattis called on Prime Minister Narendra Modi here. Stating that Modi recalled his "wide-ranging, candid, and fruitful discussions" with President Donald Trump in June this year, the Prime Minister's Office (PMO) said in a statement: "They also discussed enhanced cooperation, regionally and globally, in pursuing shared priorities for peace, stability and combating terrorism." The statement comes following External Affairs Minister Sushma Swaraj's statement in the 72nd Session of the UN General Assembly last week wherein she described Pakistan as a factory for exporting terror. Earlier on Tuesday, Defence Minister Nirmala Sitharaman, during her talks with Mattis, made it clear to the US that India would not deploy troops in war-torn Afghanistan even as New Delhi and Washington pledged to eradicate terrorism and to hold to account those who use it as an instrument of state policy, an apparent reference to Pakistan. "Both sides had reaffirmed their resolve to further develop their strong strategic partnership," the PMO statement said. 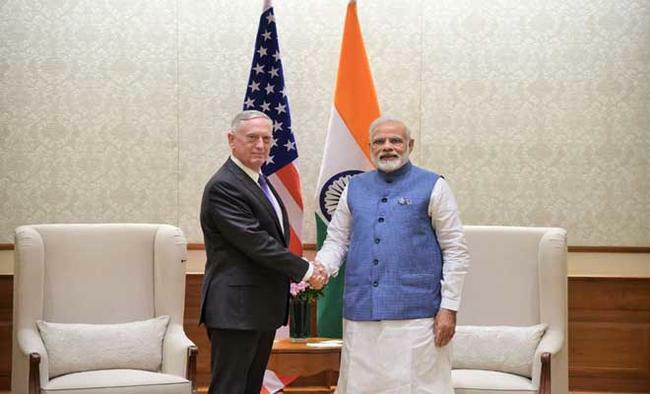 "Secretary Mattis briefed Prime Minister on the progress in advancing the bilateral agenda and implementing the decisions taken during that visit," it said referring to Modi's June Washington visit. "Prime Minister appreciated the close engagement between the two countries on regional and global issues of mutual concern," it added. Mattis arrived here on Monday in what is the first high-level visit by a senior US official to India since the Trump administration took over in January this year. New Delhi: India and the US on Tuesday discussed deepening defence ties and enhancing trade and technology cooperation, with Washington expressing interest in expanding maritime security engagement amid China's growing aggression in South China sea. US Defence Secretary James Mattis, the first high-ranking official of the Trump Administration to visit India, met Defence Minister Nirmala Sitharaman and held talks with her in the South Block. Later, the two addressed a joint media conference where Mattis said the focus was on enhancing the defence relations between the two countries, with the US viewing India as a regional stabilizer. In an apparent reference to China, which has disputes with its maritime neighbours in the South China sea, both India and the US favoured maintaining an "open, just and rules-based order". "A peaceful and prosperous future in the Indo-Pacific region is based on a strong rules-based international order and a shared commitment to international law, peaceful resolution of disputes and respect for territorial integrity," Mattis said. 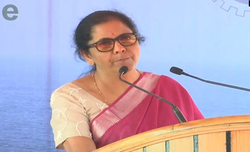 Sharing his concerns, Sitharaman said: "We also believe that disputes should be resolved through peaceful means and in accordance with the universally recognized principles of international law. I am happy to note that Secretary Mattis reaffirmed the US position in support of these principles. "I also welcome his reiteration of the US commitment to work with India in ensuring maritime security in the lndo-Pacific and as first responder to HADR (Humanitarian Assistance and Disaster Relief) situations," she said. She said the two discussed issues relating to maritime security in the Indian Ocean and the broader Asia-Pacific Region as well as regional connectivity. 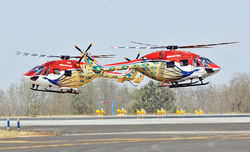 "India supports the freedom of navigation, over-flight and unimpeded lawful commerce." Their statements came amid China's growing aggression in the South China sea and its growing presence in the Indian Ocean.Mattis said the US valued India's leadership across the Indo-Pacific. "India has vital role to play in supporting South East Asia's Regional Institutions - particularly ASEAN - and in building partner capacity across the region. We appreciate India's leadership in the Indian Ocean and we seek to work together to build a resilient regional architecture," Mattis said. Declaring that expanding maritime engagement was one of his top priorities, the Defence Secretary said the US-India Malabar naval exercise with Japan was an example of the deepening cooperation. "I look forward to opportunities to increase our engagements based on shared maritime objectives and explore new exercises," he said. The US expressed interest in deepening the trade and technology collaborations under the Make in India framework. Sitharaman said India and the US have "agreed that the full implementation of the understanding reached following the announcement by the US last year recognizing India as a Major Defence Partner". She said India and the US have agreed they need to expand on the progress already made by encouraging co-production and co-development efforts. "I reiterated India's deep interest in enhancing defence manufacturing in India under Prime Minister's Make-in-India programme," she said. Mattis said the US looked forward to sharing "some of our most advanced defence technologies through the Defence Technology and Trade Initiative (DTTI)". He said the aim of his visit was to promote "pragmatic progress" between the two countries. "US-India defence cooperation has steadily expanded in recent years, underpinned by a strategic convergence between our two countries based on common objectives and goals in the region," he said.On Pyongyang, Mattis appreciated India's effort along with the international community to increase pressure against North Korea over its "dangerous and destabilising behaviour". Answering a question, Mattis said US wanted to resolve the North Korea issue through diplomatic means. New Delhi: US wants to resolve the North Korean problem diplomatically, visiting Defence Secretary James Mattis said on Tuesday. Addressing a joint press conference with Defence Minister Nirmala Sitharaman, Mattis said he appreciated India's effort along with the international community to increase pressure against North Korea over "its dangerous and destabilising behaviour". "We maintain the capability to deter North Korea's most dangerous threats but also to back up our diplomats in a manner that keeps this as long as possible in the diplomatic realm," he said in response to a question. "That is our goal, to solve this diplomatically, and I believe President (Donald) Trump has been very clear on this issue," he said.India had condemned the nuclear test conducted by North Korea early in September. New Delhi: India on Tuesday ruled out troops deployment in war-torn Afghanistan even as it pledged with the US to eradicate the "scourge" of terrorism for peace and stability. "There shall not be boots from India on the ground (in Afghanistan)," Defence Minister Nirmala Sitharaman said at a joint media conference with visiting US Defence Secretary James Mattis after talks with him. The Minister was replying to a question about India's contribution in Afghanistan and whether it would deploy its troops there. Mattis is the first high ranking official of the Trump administration to visit India amidst expectation from the US that India could change its stand on a possible military presence in Afghanistan.US President Donald Trump while unveiling his new policy on Afghanistan last month asked India to help more with the troubled country, battling decades of Islamist insurgency. Sitharaman said India's contribution to Afghanistan has been there for a very long time in development activities like building dams, schools, hospitals, roads and any institution which the country may require. "We are also at the moment training their officials in good governance... India's contribution has been there and we shall expand if necessary," she said. She also said India welcomed Trump's new Afghanistan strategy and added she had "useful discussions" with Mattis on "how we can strengthen our cooperation bilaterally as well as with the government of Afghanistan in pursuit of our common objective of a peaceful, democratic, stable and prosperous Afghanistan". Mattis lauded India's efforts in Afghanistan. "In particular, we applaud India's invaluable contributions to Afghanistan and welcome further efforts to promote Afghanistan's democracy, stability and security. We seek to expand our cooperation in building partnership across the region." Mattis said the two countries recognized the threat to global peace from terror and both agreed that there should be "no tolerance to safe havens for terrorists". "As global leaders India and the United States resolve to work together to eradicate this scourge," he said.Mattis said both India and the US have suffered losses due to terrorism and "one aspect of this is universally shared by all responsible nations that there shall be no safe havens for terror". The US Defence Secretary did not name Pakistan but Sitharaman minced no words in saying that terror attacks in Mumbai or in New York originated from Pakistan. "The very same forces which did find safe haven in Pakistan were the forces that hit New York as well as Mumbai," she said. New Delhi: India on Tuesday ruled out deploying its troops in Afghanistan but will expand its development activities to help stabilize the war-torn country. "There shall not be any (Indian) boots on the ground in Afghanistan," Defence Minister Nirmala Sitharaman told reporters after talks with visiting US Defence Secretary Jim Mattis here. She said there was a growing convergence between India and the US over the issue of terrorism in the region and condemnation of those who use terror as an instrument of state policy.